After chants of “Lock Her Up,” a peaceful pro-Trump protester was harassed, assaulted and then arrested at last Saturday’s Peoples Climate March in Washington, D.C. Police told me to back off as I recorded their rough treatment of Rita Solon , a local resident, who was simply holding a “Make America Great Again” banner and walking back and forth. Later, Solon says she was harshly treated in a Washington, D.C. jail by police and suffered serious injuries on the inside of her left arm that required her to be taken to the hospital, as well as other related injuries. This happened, she said, when police pulled her from her cell with such force that they broke a bone in her elbow. The injuries required her to be taken to the George Washington Medical Center emergency room for treatment in a waist chain with handcuffs and leg irons. Solon says she was taunted by the guards about Trump and was held for over 50 hours on what she feels were false arrest charges. Ironically, she was arrested in front of the Newseum, the national news museum dedicated to the First Amendment right of free speech and assembly, on Pennsylvania Avenue between the Capitol and the White House. 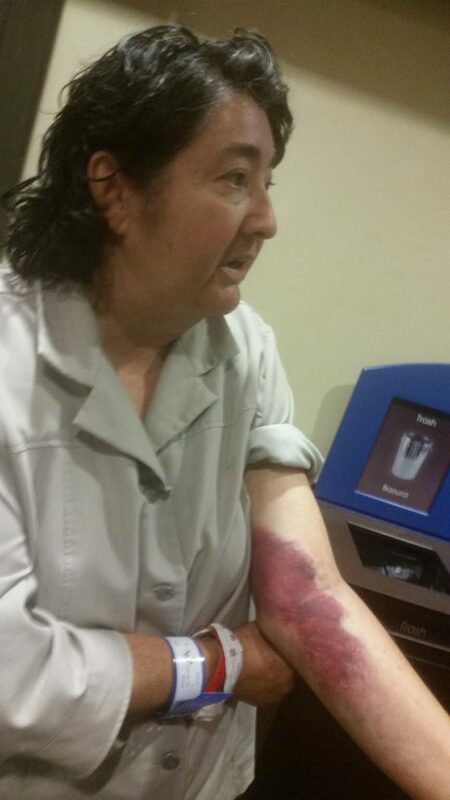 This photograph of serious injuries on the inside of the left arm of pro-Trump protester Rita Solon was taken within in the courthouse after more than 50 hours in jail. In another irony, the fascist-like treatment of Solon—who was jostled and hit at least twice by climate activists—occurred as signs in the background proclaimed opposition to the “fascist” Trump administration. Although the incident was witnessed and photographed by literally dozens of journalists and activists, my video is apparently the only recording of what actually transpired that has been made publicly available. It was posted  on the Internet last Saturday. While Solon was attacked for displaying a Trump banner, various communist and socialist groups openly sold their literature during the event. Popular titles included the Communist Manifesto and Demand the Impossible, a new book by former Weather Underground terrorist Bill Ayers. Solon appeared on the scene about an hour before the demonstrators started marching down Pennsylvania Avenue. At first she was in an area that had been cordoned off by organizers wearing T-shirts with the title of “staff” on the back. A Washington, D.C. police officer can be seen grabbing her and forcing her outside of this area. After telling the police she had a right to be there, she returned. She then began walking from one side of the street to the other, displaying her banner. Staffers and other individuals, including one with a media badge, surrounded her and followed her closely in an apparent effort to impede and block her movements. She evades these efforts and continually attempts to move away from them. These activities were allowed to continue for some time, before police again approached Solon, informing her that she had to leave or be arrested. When she refused to leave, saying she had the right to her views and to demonstrate as well, she was arrested. She was then taken away to await the arrival of a police van instead of being placed in one of the police cars in the area. At the time of her arrest, as can be seen in the video, there was no explanation from the police as to what she had done wrong or what the charge against her was. I asked repeatedly what the charge was. I told the police that they were arresting her in front of a building that had the wording of the First Amendment plastered on the front. Later, police said Solon had been charged with spitting, a form of assault. She can be heard saying that those who assaulted her by physically hitting her should be arrested, too. This reporter, who recorded the entire series of events, saw no evidence of Solon spitting on anybody. Instead, the video shows that she was punched by an unidentified staff member of the climate march as she walked by with her Trump banner, and was then assaulted by an unidentified activist in sympathy with the march who slammed into her in order to disrupt her peaceful protest. When the latter incident occurred, a staffer walked over to the activist, warning him not to do that again. However, there was no indication that the activist was asked for his name or that the name was turned over to the police so that assault charges could be lodged against him. I asked the activist why he hit a woman, and I got no response. Within minutes of her being arrested, I told the police that I had video of her being physically assaulted and offered to give them a copy of the video so they could identify the person in question who assaulted her. I also provided my business card to the police. I have not heard back from them. Solon was clearly an annoyance to the organizers of the Peoples Climate March. Their event had an anti-Trump cast and they didn’t want pro-Trump people anywhere around it. Solon was somebody they did not want to see. On the other hand, various socialist, communist, and radical Muslim groups were allowed to participate. Solon was exercising her First Amendment rights, as others were doing, and did not interfere with the activities of anybody there to protest Trump. The “Lock Her Up” chant was greeted with excitement from the left-wing protesters. In fact, this command was apparently what the organizers gave to the police to remove Solon from the scene. They acted as enforcers of political correctness. All of what I have described in this article occurred before the marchers started moving down Pennsylvania Avenue, so it cannot be argued that Solon was somehow interfering with the actual demonstration. This incident appears to be another case of left-wing political violence allowed, and even sanctioned, by a local police department. As I recorded the treatment of this woman by the police, one officer seemed to take offense to my interest in the case, telling me to back away as I was recording the event. One wondered if Rita Solon and I were in cahoots and whether she was my wife. In fact, I had never seen or met her before in my life. I had acquired press credentials to cover the march by registering in advance with the organizers and had a press badge visible at all times. I used the camera completely unaware that a woman who only wanted to wave a Trump banner would be subjected to such brutal treatment. The public has a right to a factual record of what actually transpired.